Introduction Mechanical thrombectomy (MT) has transformed the treatment of ischemic stroke. However, patient access to MT may be limited due to a shortage of doctors specifically trained to perform MT. The studies reported here were done to (1) develop, operationally define, and seek consensus from procedure experts on the metrics which best characterize a reference procedure for the performance of an MT for ischemic stroke and (2) evaluate their construct validity when implemented in a virtual reality (VR) simulation. Methods In study 1, the metrics for a reference approach to an MT procedure for ischemic stroke of 10 phases, 46 steps, and 56 errors and critical errors, were presented to an international Delphi panel of 21 consultant level interventional neuroradiologists (INRs). In study 2, the metrics were used to assess 8 expert and 10 novice INRs performing a VR simulated routine MT procedure. Results In study 1, the Delphi panel reached consensus on the appropriateness of the procedure metrics for a reference approach to MT in ischemic stroke. 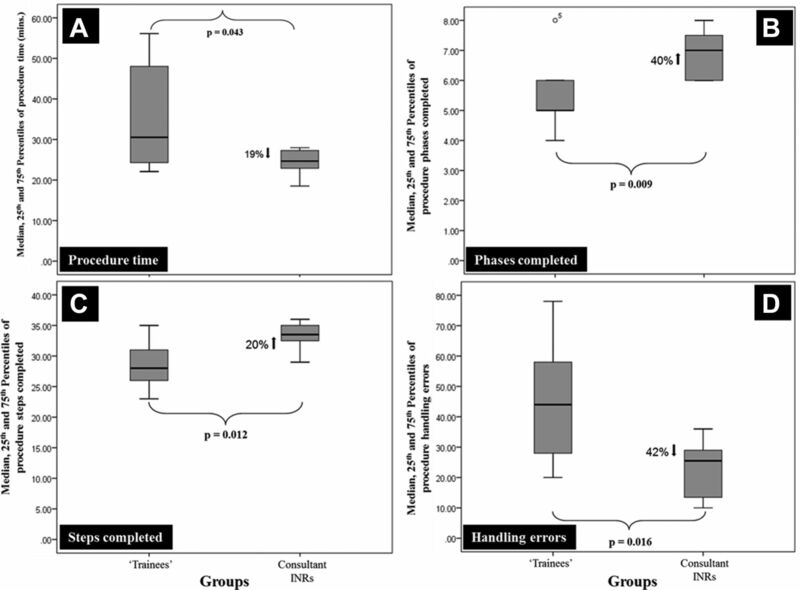 Group differences in median scores in study 2 demonstrated that experienced INRs performed the case 19% faster (P=0.029), completed 40% more procedure phases (P=0.009), 20% more steps (P=0.012), and made 42% fewer errors (P=0.016) than the novice group. Conclusions The international Delphi panel agreed metrics implemented in a VR simulation of MT distinguished between the computer scored procedure performance of INR experts and novices. The studies reported here support the demonstration of face, content, and construct validity of the MT metrics. Despite the proven effectiveness of MT, access is limited in regions and countries, primarily due to the shortage of interventional neuroradiologists (INR) specifically trained to perform MT. Traditionally, doctors acquire their skills to perform new procedures on patients. However, image guided procedures impose unique human factor challenges, which expose patients to potential risk during the doctor’s advancement along the learning curve.4 This traditional approach to training can be protracted for doctors to develop skills to achieve proficiency in performance. Currently, there is no objective, transparent, and reliable way to verify proficiency of performance. Optimal simulation training platforms and training programs are derived from a comprehensive procedure characterization, and the identification and definition of procedure steps and deviations from optimal performance (or errors)12 which once validated are used to give trainees formative feedback on their performance. The ultimate procedural goal in MT is the safe and fast recanalization of the occluded target artery to restore blood supply to ischemic brain tissue. This must be performed without damaging the navigated proximal arteries or the introduction of air or thrombotic emboli into new territories which were previously unaffected (embolization into new territory). The studies reported here undertook a process to characterize in detail a safe reference approach to MT for a neurovascular trainee who has demonstrated independent competency in diagnostic cerebral angiography. We sought to characterize the endovascular procedure per se and not cover the issues of diagnostic imaging, patient selection, or anesthesia. It was hypothesized that we could identify procedure, phases, steps, and procedure errors (deviations from optimal performance). It was also hypothesized that experienced INRs could reach consensus on these metrics, and when integrated into a physics based virtual reality simulation that they could distinguish between the performance of experienced and novice INRs performing the procedure on the simulator. This study received expedited institutional review board approval from the Cork University Hospital ethics committee (ECM 4 (d) 04/07/17; June 22, 2017). The research was supported by a grant from the Swedish government agency for innovation (Vinnova) to Mentice AB (Gothenburg, Sweden). Three INRs (MH/TL and RC), a behavioral scientist (AGG), an interventional radiologist (LL), and a senior project engineer (JL) formed the procedure characterization group. The INRs had >8 years of practice experience and mastered the full range of intracranial and spinal neurovascular interventions. The project focused on the anterior circulation, while noting there is definite overlap with performance of thrombectomy in the posterior circulation. Procedure characterization was performed over a 7 month period in five face to face meetings. Additional time was spent at the simulator development facility to optimize technical features regarding the fidelity of the simulation platform. The procedure was deconstructed into 10 phases (table 1), consisting of 46 steps; 57 possible errors were defined. Error severity was defined as either critical or non-critical. Phases I and X are generic skills in endovascular therapies. Safe retrograde femoral access and closure were defined as being in accordance with institutional protocols. There are certain tenets in angiography that are constant, irrespective of which organ is being studied. In general, a catheter should only be advanced over a suitable guidewire. If resistance to catheter or wire advancement is felt, pressure should be released in order to ensure that the tip of the wire or catheter has not damaged the vessel lining. When a catheter is being manipulated in the absence of a wire movement it should be backwards rather than pushing forwards to avoid ‘vessel scraping’. Deviation from these basic principles were deemed to constitute an error. Phase II was divided into subsections a and b. Selection of the innominate and right internal carotid arteries in a type I arch is generally straightforward and can be performed by a forward curve catheter. These catheters can be used directly once the leading guidewire has selected the target cervical vessel. Selection of the left common and internal carotid arteries can be more challenging. These often require the use of a reverse curve Simmonds (SIM 1, 2, 3 etc) catheter. This catheter requires manipulation in situ to form the working shape. This is technically demanding and requires additional steps. There are several recognized ways to form the working shape of the SIM catheters, in the ascending aorta over the aortic valve, in the left subclavian artery over the abdominal aortic bifurcation. The group all form the catheter in the left subclavian artery by preference. This was felt to be the safest and most reproducible technique by the group (unanimously agreed by the subsequent Delphi panel). Phases II and IV relate to the attainment of a stable balloon guide catheter position in the internal carotid artery. In the original simulated run, steps within phases III and IV had to be performed sequentially such that if a step in phase IV was performed prior to the completion of any of the phase III steps an error was recorded. Experiences within the group using the simulator and Delphi discussions demonstrated that these two phases formed a continuum and that there are many occasions where performing a step from phase IV before the end of phase III would be reasonable, safe, and would not constitute an error. Variation in the order of steps in these phases was not penalized. Attempts to perform any steps from phase V prior to the completion of phase IV was judged to represent unacceptable deviation from the protocol. Phase III, step 13, was further subdivided depending on the capabilities of the angiographic equipment. The majority of intracranial procedures are performed on biplane equipment but the use of single plane systems in MT is not uncommon. Phase III, step 13a, pertained to units with biplane equipment. The frontal tube is centered on the aortic arch and the lateral tube is centered more cranially to visualize the common carotid artery bifurcation. The roadmap imaged acquired here allows the operator to assess the movements of the proximal catheter construct in the arch while visualizing the carotid bifurcation and distal wire position. Step 13b would be employed if the procedure was being used on single plane equipment. The degree of x-ray field magnification was described in non-specific terms as large/small field of view (FOV). This was in response to the fact that different manufacturers of angiography equipment provide different FOVs. In addition, different operators have different preferences for different FOVs. As long as the choice of FOV did not compromise a safe technique, for instance selecting a FOV that precluded visualization of the distal wire tip position, no comment was made on FOV. A panel of 21 experienced INRs (mean age 48 (SD 7) years; 18 men; all consultant level, including 10 professors), who performed a mean of 45 (SD 10) MT stroke cases per annum, from seven European and Scandinavian countries (Belgium (n=1), Denmark (n=4), Germany (n=12), Norway (n=1), Netherlands (n=1), Sweden (n=1) and UK (n=1)) convened in Aachen, Germany in May 2017. At the start of the Delphi meeting, the project and concepts of ‘proficiency based progression’ were outlined and the procedure metrics for a reference approach to MT presented. Each phase and step were discussed, and the proposed metrics were edited in real time such that a vote was taken on an agreed consensus statement. The most significant alteration to the proposed metrics was that the use of balloon occlusion guide catheters (BGCs) was mandated. Additional changes and edits were made in real time, and mainly concentrated on the precision of the language and operational definitions of procedure steps and errors. A summary of the changes that were made to the procedure steps and errors are reported in table 2. At the end of each phase discussion a vote was taken to ensure majority consensus (table 2). All phases were passed with large majorities. The smallest consensus vote was for phase V, with 85% in favor of the characterization. There were zero votes against the characterization in phase V but there were three abstentions. No votes (ie, against the phases characterized) were only recorded for phases I and IV, and these were by a single individual. Eight consultant/professor level and 10 trainee INRs participated in this study. Mean age of the consultant/professor level INRs was 48 years (range 40–60 years) and for trainees, 36 years (range 32–40 years). Consultants were from Germany (n=5), the UK (n=2), and Denmark (n=1). Trainees were from the UK and Ireland (n=5), Germany (n=4), and The Netherlands (n=1). The consultant/professor level INRs completed on average 42 thrombectomy procedures per year (range 40–50). The trainees had on average been practicing for 15.8 (0–60) months, supervised cerebral angiograms 70 (0–200), independent cerebral angiograms 123 (0–300), assisted interventions 95 (5–300), first operator interventions 19 (0–80), assisted in thrombectomy cases 12 (0–40), and first operator thrombectomy 3 (0–10). 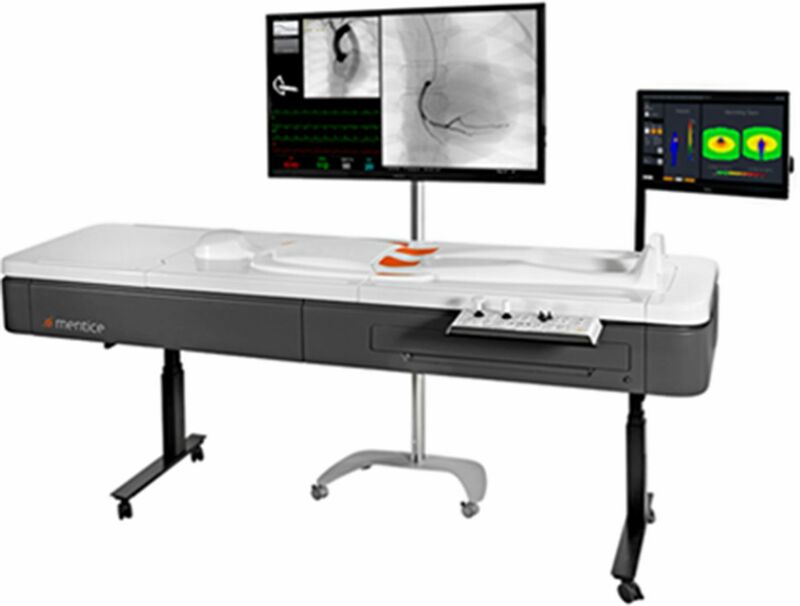 The vascular interventional simulation trainer (VIST) virtual reality simulator. The metric based performance characterization and operational definitions of MT, as described in study 1, were used to establish the simulation and assessments. Neuroradiology trainees received a didactic explanation of acute stroke interventions. They then observed a simulated thrombectomy being performed by a faculty expert INR. The demonstration was performed with full audiovisual support, and the phases and steps of the procedure were verbally described in real time. Trainees then performed a reference thrombectomy case on the VIST physics based virtual reality simulation platform and enabled performance metrics agreed at the Delphi meeting (US Provisional Patent Application No 62667500). The case was performed in the presence of one of the INR faculty members. The faculty members assisted the delegates with the use of the simulator and preparation of the modified procedure apparatus required. No guidance regarding the performance of the thrombectomy procedure (order of steps, phases/catheter or wire manipulation/x-ray screening/table positioning, etc) was offered by the supervising faculty. Performance differences were compared for statistical significance with Mann–Whitney U tests using SPSS statistical package (V.24).17 Statistical power calculations were extrapolations based on previous research using the VIST simulator and performance metrics for carotid angiography.16 The mean number of errors for the attending clinicians in the control arm of the study was 15.17 (SD 3.1). We estimated a 26–42% difference between the experienced and novice INR groups based on previous studies.18 The statistical power of a 26% difference between the groups (ie, consultants INRs=15.17 vs novice MT INRs=19.11 was calculated for n=8 in the consultant group and n=10 in the novice group with an α of 5% and a β of 20%) was found to be 0.815 for a two tailed test. A difference of 42% between the groups (ie, consultants INRs=15.17 vs novice INRs=21.54) and using the same statistical power calculation methodology gave a statistical power of 0.996 for the same sample sizes. The main performance parameters assessed and compared were (1) duration of the procedure in minutes, (2) number of procedure phases completed, (3) number of procedure steps completed, (4) number of handling errors made, (5) amount of contrast agent used during the procedure (in milliliters), and (6) amount of fluoroscopy (in minutes) used in performance of the procedure. Figure 2A shows the median, 25th and 75th percentile ranks (PR) of the number of minutes it took each group to perform the procedure. Based on the median scores, the consultant INRs performed the procedure 19% faster than the trainees, and their performance times were also more homogeneous, as indicated by the smaller range of scores (consultant range=9.45 and trainee range=34.03). This difference was statistically significant (median=24 (25th PR=23 and 75th PR=28) vs trainee median=31 (25th PR=24 and 75th PR=50), Mann–Whitney U=17.0, Z=−2.04, P=0.043). A similar performance pattern was observed for procedure phases completed (figure 2B). The consultant INRs completed 40% more procedure phases and this difference was statistically significant (consultant median=7 (25th PR=6 and 75th PR=8) vs trainee mean=5 (25th PR=5 and 75th PR=6), Mann–Whitney U=11.5, Z=−2.61, P=0.009). Figure 2C shows that the consultant INRs also completed 20% more procedure steps and the difference was statistically significant (consultant median=34 (25th PR=32 and 75th PR=35) vs trainee median=28 (25th PR=25 and 75th PR=32), Mann–Whitney U=12.0, Z=−2.5, P=0.012). The largest difference between the two groups was observed for handling errors (figure 2D). The trainees made 42% more handling errors than the consultant INRs and this difference was statistically significant (consultant median=26 (25th PR=12 and 75th PR=29) vs trainee median=44 (25th PR=27 and 75th PR=60) Mann–Whitney U=13.5, Z=−2.36, P=0.016). Median, 25th, and 75th rank scores of (A) performance time (in min), (B) procedure phases completed, (C) procedure steps completed, and (D) procedure handling errors made by trainees and consultant interventional neuroradiologists (INRs). Although the trainees used 11% more contrast agent (consultant median=36 (25th PR=29 and 75th PR=39) vs trainee median=40 (25th PR=29 and 75th PR=77) this difference was not statistically significant (P=0.46). The consultant group also used 24% less fluoroscopy than the trainees but this difference was not statistically significant (consultant median=11 (25th PR=10 and 75th PR=12) vs trainee mean=15 (25th PR=11 and 75th PR=22). Using the IQR scores of the consultant INR group, we calculated the variability range for each dependent variable score. Trainee time to complete the procedure demonstrated 3.6 times greater variability than the consultant INR group. A similar pattern was observed for phases completed (two times greater), procedure steps completed (1.7 times greater), handling errors made (2.235 times greater), contrast agent used during the procedure (seven times greater) and fluoroscopy time used during the procedure (3.7 times greater). Acute ischemic stroke is a leading cause of death and long term disability. MT is now the recommended treatment of choice for ischemic stroke due to large vessel occlusion in the anterior cerebral circulation. It has led to an improvement in outcomes in comparison with other treatments3 with a reduction in long term disability.25 Worldwide, there is a shortage of clinicians trained and skilled enough to perform the procedure, which is a significant impediment to the benefits that this treatment can confer on patients and healthcare systems. Virtual reality simulators for endovascular procedures are orders of magnitude superior to simulators that are used in image guided surgery.12 They are however not much better than expensive video26 games without procedure performance metrics. Angelo et al26 demonstrated that simulation based training without metric based feedback and a requirement to demonstrate proficiency benchmarks conferred little benefit over traditional training. The original simulation platform utilized air filled contrast syringes. All in the characterization group recognized that this detracts from the fidelity of the scenario. In tandem with this project, a closed pressure monitored fluid injection system has been developed which will be incorporated into any future work. This technical development will considerably improve the fidelity of the physics based VR MT simulation. In this study, we only characterized a straightforward and reference approach to an MT procedure. We believed that if a trainee could not perform a straightforward procedure it was unlikely they would be competent to perform a more complex procedure. Furthermore, learning to perform MT using a ‘standardized’ or reference approach facilitates learning by giving trainees a safe and effective approach (which they can learn to perform to a quality assured performance level) from which they can hone the approach to the procedure that best suits them. There are other approaches to the performance of MT which were not characterized in this study. The methodology employed here can however be used to characterize and validate the metrics for these approaches in the same detail as reported here. Study 1 characterized a referenced approach to MT and consensus was reached on the essential phases, steps, and procedure errors to be avoided. The metrics were then incorporated into a physics based VR endovascular simulation. The results in study 2 showed that the experienced INRs completed more of the case, faster, and with fewer errors. The results from these studies offer support for the face, content, and construct validity of the MT metrics. The next step in the validation of these VR enabled metrics is to use them as part of a systematic MT training program.
. From the operating room of the present to the operating room of the future. Human-factors lessons learned from the minimally invasive surgery revolution. Semin Laparosc Surg 2003;10:127–39. Institute of Medicine. Graduate medical education that meets the nation’s health needs. Washington, DC: Institute of Medicine, 2014.
. Training 21st century clinical leaders. Dublin, Ireland: Royal College of Physicians in Ireland, 2014.
. Virtual reality surgical simulator. The first steps. Surg Endosc 1993;7:203–5. Institute of Medicine. Graduate medical education that meets the nation’s health needs: The National Academies Press, Washington DC., 2014.
. Fundamentals of surgical simulation; principles & practices. London: Springer Verlag, 2011.
. Virtual reality simulation for the operating room: proficiency-based training as a paradigm shift in surgical skills training. Ann Surg 2005;241:364-72.
. Metric-based simulation training to proficiency in medical education:- what it is and how to do it. Ulster Med J 2012;81:107–13. IBM SPSS Statistics [program]. 24 version. New York: IBM SPSS, 2016. Contributors All of the authors contributed to the writing of the article. RC, TL, and MH are very experienced mechanical thrombectomy interventional neuroradiologists. LL and PH are very experienced clinicians and medical education specialists. JL is a senior computer engineer. AGG developed and helped validate proficiency based progression simulation training. TL, MH, RC, LL, JL, and AGG have characterised a reference approach to mechanical thrombectomy. JL developed and formatted the VR simulation from the CT angiography of the stroke patient reported in this paper. AGG and PH produced the first draft of this paper. All authors contributed to editing the paper post editorial review. Study 1, study design and data collection: RC, TL, MH, JL, LL, and AGG. Study 2, study design and data collection: RC, TL, MH, JL, PH, and AGG. Data analysis: RC, TL, MH, JL, and AGG. Paper writing: RC, TL, MH, JL, PH, and AGG. Results interpretation, paper critical revisions, and agreed on final draft: RC, TL, MH, JL, PH, LL, and AGG. Funding The research and researchers on this paper were supported by a grant from the Swedish government agency for innovation (Vinnova) to Mentice AB (Gothenburg, Sweden) to characterize, develop, and then validate the metrics for a reference approach to performance of mechanical thrombectomy. Competing interests MH has received honoraria from Microvention, Medtronic Neurovascular, Mentice AB, and Stryker Neurovascular for consulting and proctoring. RC has received honorarium for speaking (Stryker Neurovascular, UK) and educational sponsorship to attend meetings/conferences from Microvention, Stryker, Medtronic, Penumbra, and Johnson & Johnson. JL works as an engineer at Mentice and developed the VR model of the real patient data. LL has served as a clinical advisor and then Medical Director of Mentice.